I love this time of year, when everything in nature is just waking up; impatiently waiting in the sidelines, ready to burst into life. Everything feels hopeful and full of promise. There’ve been a few memorable pieces that have come through the workshop since I last wrote my last update, but I thought I’d show you one of the latest projects that Barry and I have just worked on. Hopefully there aren’t too many images to wade through, but I figured it might be interesting to see how they came together. 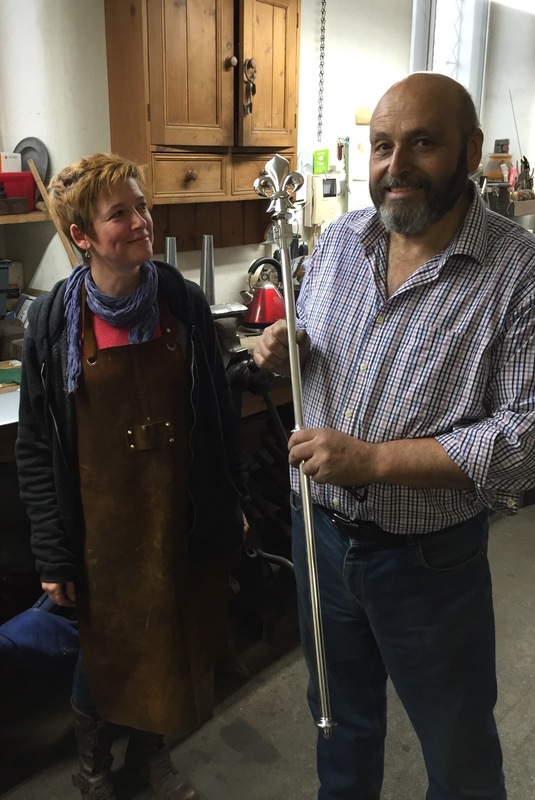 Barry was asked to make a Verger’s Staff for Sherborne Abbey in Dorset and after taking delivery of the first finished piece, they promptly ordered a second! It was really great to be able to work alongside and assist Barry on a project and see him work his magic, whilst also being able to bring something to the table. I worked on sculpting, moulding the top section, whilst he took care of everything else. He’s so amazingly skilled and fast - just watching him solder is incredible. He uses the torch with such precision, like a pencil, in the hands of a skilled draftsman. 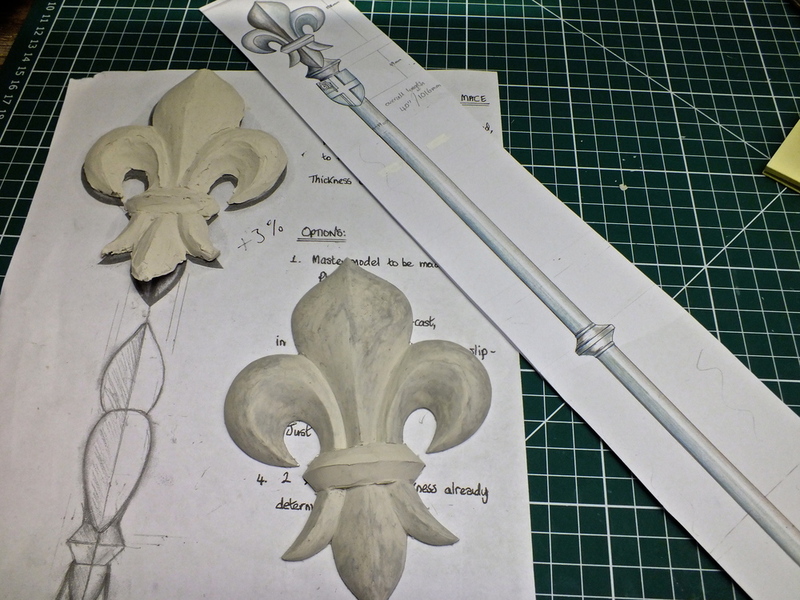 The Fleur-de-lis was sculpted in plasticine, moulded and then cast in two hollow halves in silver whilst the joining sections were spun on a lathe. We used three different solders, with different melting points, at various stages of the construction. This stops it from falling apart when another section is added close by. The first elements were soldered with enameling solder - which melts at just less than 100 degrees below the melting temperature of silver. So the real skill lies in being able to hold the piece precisely at a certain temperature, without burning the flux away or melting the metal, especially on a larger area. Another fun project I worked on recently was a spectacularly delicate and intricate mother of pearl Pagoda, inside Burghley House, which was in need of some TLC. Apparently it may have been based on an early warning system for earthquakes in China, where the tiny bells would ring as it picked up the tiniest vibration. It was such a sensitive and delicate thing I could see how that might work, as it shakes every time anyone walks across the carpet in front of it. Hard to imagine the original journey it must have taken, all the way from China back in the 1800’s. One of the best exhibitions that I’ve seen over the last few months, that really captured my imagination, was at ‘an evening with Charlottes de Syllas,’ at her Exhibition of Sculpted Gemstones, at The Goldsmiths’ Hall (until 22nd July). She has such a cool and relaxed manner about her, which she imparts upon her pieces with such a serene and magical touch. I loved the way that the stones seem so compliant and accommodating, to her exquisitely carved and often playful designs. It took me back to my lapidary class in Portland, under the tulelage of the wonderful Bruce McKay. It also got me even more excited about my forthcoming trip back to Oregon in July, where I think I shall have to drive into the desert and go ‘Rockhounding’ once more. I think I fancy digging for some sunstone!